There Are Strong Rumors That Asad Umer Might Lose His Finance Ministry And This Will Be A Huge Tabdeeli! There Are Strong Rumors That Asad Umar Might Lose His Finance Ministry And This Will Be A Huge Tabdeeli! Pakistan Tehreeke Insaf (PTI) led government is planning to make major shuffles in the cabinet ministers. According to media reports, Prime Minister Imran Khan has called a meeting today to examine the progress of his ministers and after reviewing their performances, he’ll make the changes. At least five cabinet members are going to be removed from their positions including petroleum, finance, and interior minister. Ghulam Sarwar Khan, Asad Umar and Shehryar Afridi are expected to get discharged from the federal minister’s seat. 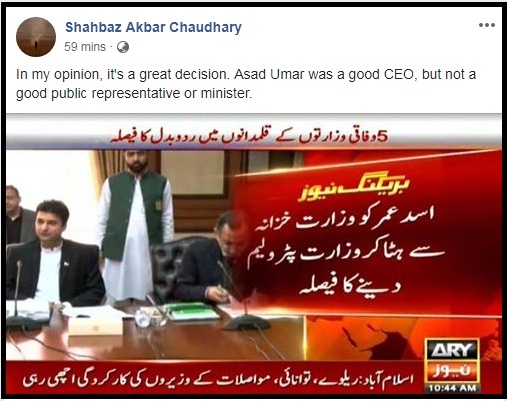 And According To Media Reports, Asad Umar Has Been Removed As Finance Minister! 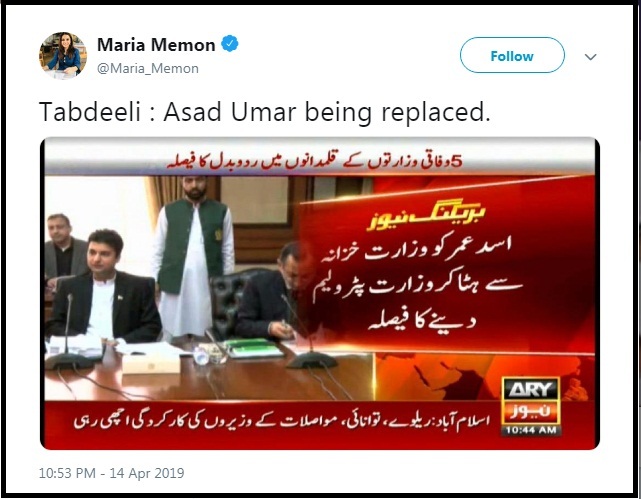 The famous Pakistani journalist and news anchor, Maria Memon shared a picture in her tweet saying that ‘Tabdeeli: Asad Umar being replaced’. ‘Asad Umar Removal’ is among the top trends of social media but Information Minister Fawad Chaudhary denied the claims regarding his removal. Fawad Chaudhary Said That Media Should Play Responsibly! Fawad Chaudhary took it to Twitter and said that there is no truth in reports regarding changes in posts of federal ministers. “The prime minister has the power to change ministers and the media should play a responsible role on this subject. Pakistan is going through an important phase and such speculations create confusion which is not beneficial for the country,” he added. Zartaj Gul – Minister For Climate Said That Reporters Must Not Spread Unverified News! However, People On Social Media Consider His Removal A ‘Blessing’ For Pakistan! Asad Umar’s Have Disappointed PTI-Supporters! It Seems That People Were Waiting For This News! Senior Journalist Hamid Mir Also Said In A Talk Show That Only Petroleum Minister Will Be Removed From The Office! Asad Umar Is In Hot Waters Since He Took Charge As Finance Minister! When PTI won General Election 2018, it was decided that Imran Khan will appoint Asad Umar as his finance minister due to his immense experience in finance. Asad Umar was the epitome that PTI supporters and people could generally look up to, his success stories were all over the social media but as soon as he took the oath as finance minister, people started criticizing his every single decision. From presenting mini-budget to raising petroleum price, the opposition leaders compared his performance with ex-Finance Minister Ishaq Dar and slammed him for his wrong decisions. His recent statement about Bilawal Bhutto’s speech in English in National Assembly gave Asad Umar’s opponents another chance to criticize him. But it seems that all Asad Umar care about is his work, he didn’t even respond to PPP-supporters yet. It is expected that the posts and ministries of certain ministers will be changed as part of the reshuffle. “A reshuffle is expected in the Ministry of Finance after talks with the International Monetary Fund (IMF) conclude, The head of FBR may be changed,” the sources added.